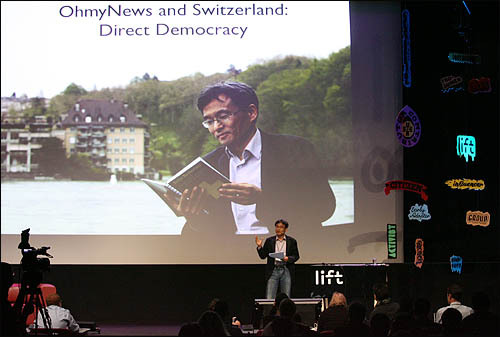 Before I arrived at the LIFT forum, I visited a few other places in Switzerland to learn about this country’s special political system. As most of you know, Switzerland is the country of direct democracy. This is interesting to OhmyNews, and me, because we do a kind of direct democracy in the world of media. Last Sunday, I went to Glarus, one of the smallest of the 26 cantons of Switzerland. While there, I saw true direct democracy. Sunday, during heavy rain cold temperatures, about 5000 people came to the central plaza to participate in a landsgemeinde. This is town meeting happens each year. The citizens who go elect the canton leadership and directly approve the actions of parliament. In Glarus, every citizen is a legislator ? the same concept as OhmyNews. Since I founded OhmyNews in 2000, we have made a direct democracy in the world of media. When we started, we had just 727 citizen reporters. Now, in our tenth year, we have over seventy thousand. They are elementary school students and college professors. Some are just 9-years-old. Others are 80. They write about 200 articles per day. If someone asked me what OhmyNews’ most important accomplishment was, I would reply that we turned a dream into reality. 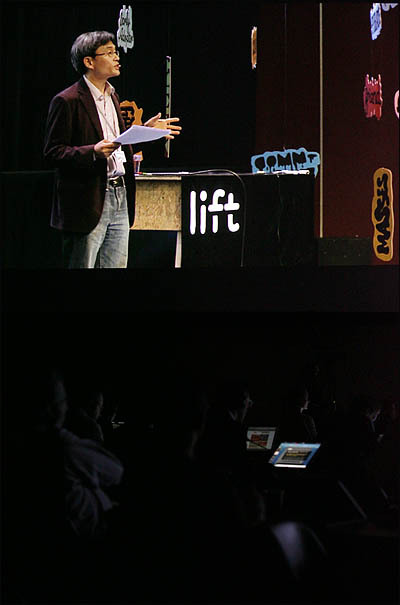 When we started OhmyNews, the idea of creating citizen-powered media was just a dream. But today, ten years later, the dream has come true. Today, our slogan, our ideas, our trust that every citizen can participate in the news process is not just commonplace ? it is common sense. Almost all online newspapers now allow users to participate in many ways. Who are these citizen reporters? Mr. Shim Jae-Chol is an example. Mr. Shim is a high school teacher. As of this morning, he has written 1685 articles on OhmyNews. Most of his articles are about soccer; he is crazy about the English Premiere League. In Korea, if you want to watch the Premiership live on TV, you must stay up late. Most games are on between 2 and 5 a.m.
And yet, Mr. Shim posts most of his articles between seven and eight a.m. This means he does not sleep! He watches the games, writes his article, posts it, and goes to work. This is a true commitment. It shows his passion. But at OhmyNews this kind of passion is not rare. Many citizen reporters have written more than 100 top stories. Many others have written more than 1000 stories for other pages. We find that the passion of our citizen reporters far exceeds that of most staff reporters at other newspapers. So where does their passion come from? I think it is from the same source that citizens of Glarus find their passion for the landesgeminde and direct democracy. But is citizen participation always good? To me, participation is best when it is done for the right reasons. At OhmyNews we want people to get involved to make their community better ? not just because they want their name on an article. It is clear that the Glarus landesgeminde model cannot solve every problem of politics. The OhmyNews citizen reporter model cannot solve every problem in the media. Sometimes, citizens and amateurs need someone to help direct their passion. Glarus has the landesgeminde, but it also has a local parliament and government. These institutions support the citizens in many ways. A similar process takes place at OhmyNews. The basic OhmyNews model is the citizen reporter system: every citizen can be a reporter. However, we also have staff reporters. They work with the citizens to make our website better. When I started OhmyNews, there were only four staff members. Now there are 70! 40 of them make content. Staff reporters have three roles. First, they are editors for our citizen reporters. Our staff helps citizens write better stories. They check facts, look for copied work, ensure fairness and guard against libel. Second, staff members work with citizens in the reporting process. One example of this is our reporting teams. Two years ago, OhmyNews created a team to cover the Beijing Olympics. Ten OhmyNews reporters ? half staff, half citizen ? went to China. Last march, nine reporters went to Paris to understand how France keeps high birthrates. Again, our team was half professional reporters, half expert citizens ? including some working mothers. Third, our staff reporters work in places that are hard for citizen reporters to reach. For example, in 2002 when the new president was elected in Korea, OhmyNews Staff Reporters were the first reporters to interview him. In 2008, huge protests against government policy erupted in the center of Seoul. Staff reporters did 72 hours of non-stop live web broadcasting. Staff reporters also go places citizens cannot, like the press office of the president and national assembly. We have another group of staff that is working to make the OhmyNews model sustainable. Until now, about 70 percent of our income has been from advertising. Our goal is to bring that down, and make 50 percent of our revenue from content and our readers. Most recently, this team invented two new income models. The main service OhmyNews offers to the club is education. One day per week we invite special guests to give lectures at our offices about understanding and changing society. Any member may come to study. We also live-broadcast the lectures for those who want to watch online. Another new model for sustainability is the “tip” system. Readers can contribute directly to a citizen reporter for a story they like. So far, the biggest contribution was about 21,000 euros. About 6,000 readers contributed to that citizen reporter! A professor wrote the story, a critique of a Supreme Court decision. In our system, 60 percent of the tips money to go the citizen reporter, and the rest goes back into the operation of OhmyNews. In the future, OhmyNews will find more ways to sustain our work. We are starting OhmySchool and OhmyBook ventures. OhmyNews will soon be a force in the education and book publishing businesses. Direct participation of citizens is, for me, an exceptionally good thing. It moves us from being a simple spectator to active contributor. But in order to maximize that good, direct participation should also be responsible. It should be participation with credibility. Participation that thinks of others. And it must be sustainable participation. On this trip, I have learned a lot from Switzerland. After visiting the landesgeminde, I went to Interlaken. I was surprised to learn that, here, every citizen is an actor! For the past 98 years, the community of Interlaken has put on a dramatization of the Swiss legend, William Tell. The cast is made up of 200 regular citizens from the Bern canton. Children, parents, and grandparents are a part of the play. When I visited the show, I interviewed a 24-year-old woman named Maria Theresa. She is a doctor’s assistant by day, and has a very large part in the play at night. She had never studied acting, and had never worked on a show until she started with the William Tell play this year. Oh, my, news! Her words struck at my heart. Her stage is not the stage itself, not just the theater. Her stage was the whole world. Her goal is not just personal success. It is instead to make the world a better place for other people. In Glarus, every citizen is a legislator. 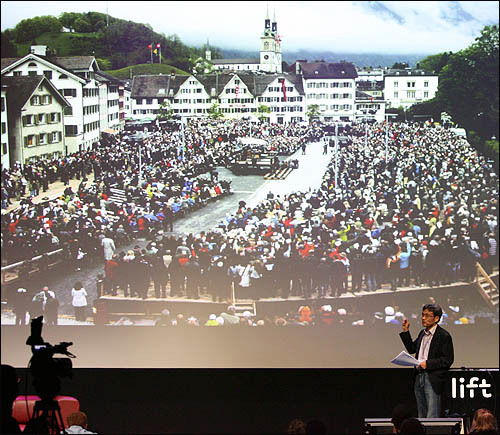 In Interlaken, every citizen is an actor. At OhmyNews, every citizen is a reporter. Even though we are in different areas and different roles, we stand on the same stage in this global village. We aim to make a better world through meaningful participation. Everyone in the room: that could be you!